While Ontario metal vets Kittie were experiencing some downtime only a few years ago, the promise of a 20th anniversary DVD was still on the horizon after a successfully completed Indiegogo campaign. Now, some new information on the band's career-spanning documentary has been revealed. 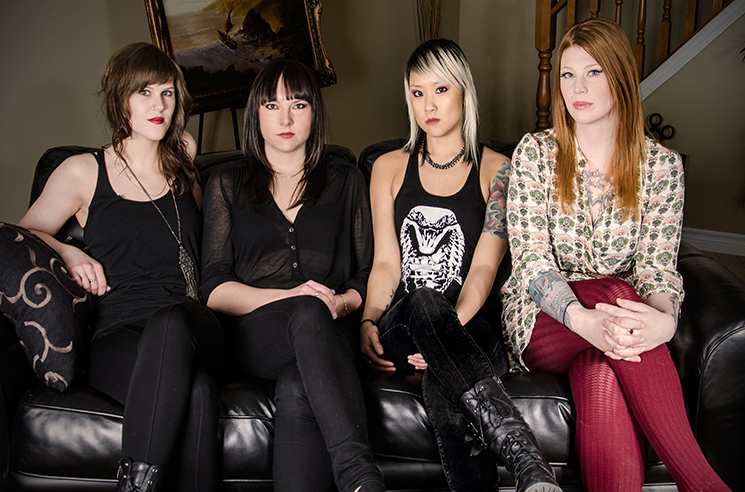 According to director Rob McCallum, the band have set Kittie: Origins/Evolutions as the title of their forthcoming doc. In a video update, McCallum breaks down the structure of the film in detail. "This is going to be somewhat of a two-part documentary," he said. "The first part will be 'Origins' and it will look at the first ten years of the band's history. And the second part will be 'Evolutions' and it will take a look at the second half of the band's history so far. So you can see the ten-and-ten split really kind of makes sense." McCallum also reports that there is still some additional shooting to be done and that each half may run around 80 minutes in length. The video update also includes a rough cut of the film, featuring snippets of interviews with guitarist Fallon Bowman and founding siblings Morgan and Mercedes Lander. Watch the video update in the player below. Thanks to Blabbermouth for the tip.